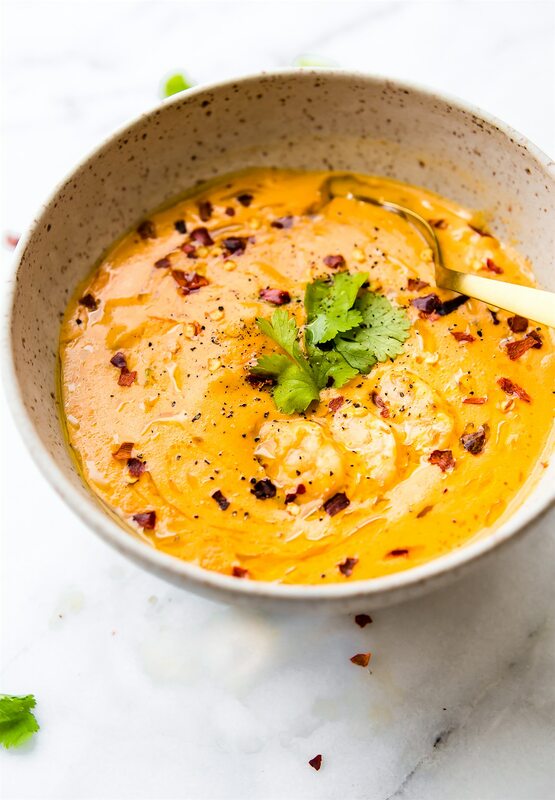 Roasted red pepper bisque with shrimp is dairy free, paleo, Whole 30 compliant, and totally delicious! 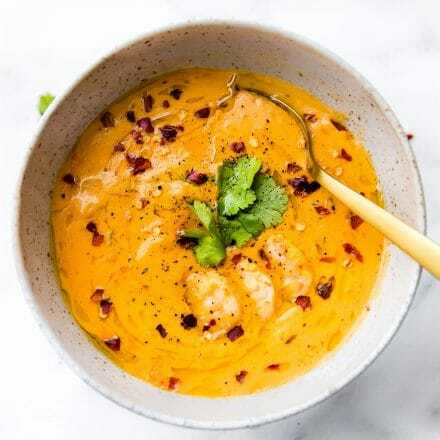 A spicy bisque with healing, immunity boosting nutrients. Perfect for cold weather or when you’re under the weather! Also a great way to get veggies into your meal. 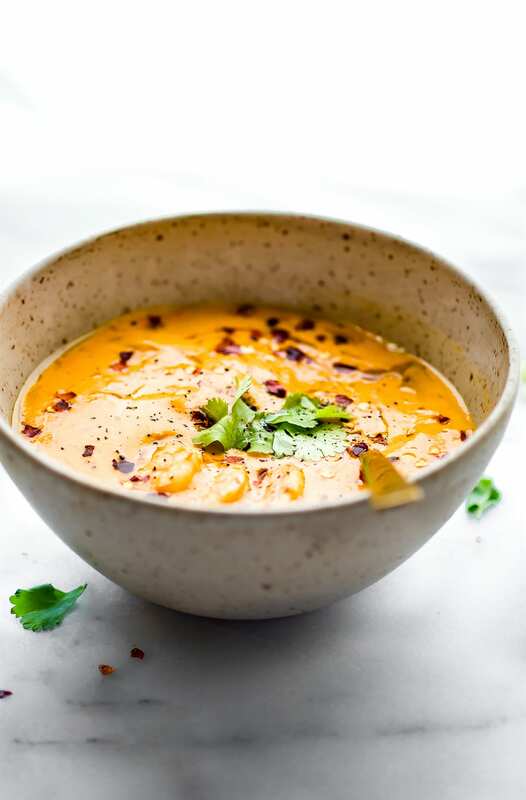 Nourish your family, feed your friends, or enjoy this robust roasted red pepper bisque recipe all to yourself. I’m really sure many people can justify a thick bisque soup recipe as being “healing,” but I’m going with it because gosh darn it, real food CAN DO wonders. That being said, this roasted red pepper bisque Cotter Creation is brought to you by the letter c… CAPITAL C! A CREAMY soup with spicy shrimp. A Cozy, Comforting, Vitamin C rich, Cold and Cough Curing, Clear your sinuses bowl of COMFORT… that’s also paleo, whole 30 friendly, dairy free, and all the things healthy. Yes yes, but that wasn’t my main focus here, albeit it is a bonus benefit. The real focus of this red pepper bisque recipe is on the MEGA dose of Vitamin C.
Mr. Cotter, the Kiwi, was sick ALL weekend. Coughing, Cold, Congestion, etc. C where I’m going with this? Bahaha, my puns, sorry, they slip in. Poor guy. I think life caught up to us one at a time. I got sick right before the move, he got sick after. But at least one of us was healthy enough to take care of each other during, ya know? Anyway, the red pepper bisque is my HEALING soup (errr bisque?) 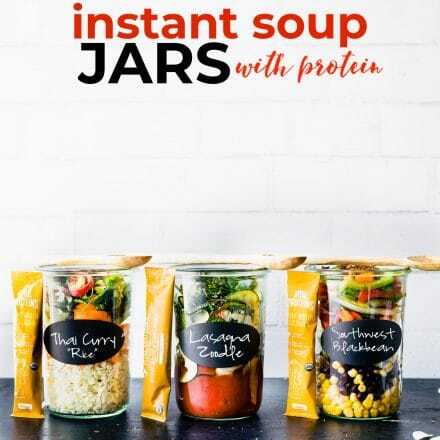 packed with lean and mean spicy (protein rich) shrimp, that mega dose of Vitamin C red pepper, and creamy coconut MCT fats. Not to mention broth with healing herbs and spices. Dude, if you are not breathing fresh and cured of all COLD and SICKNESS by the time you finish this soup, then your doomed. I’m kidding. Kinda. Honest to goodness, this is our healing soup. 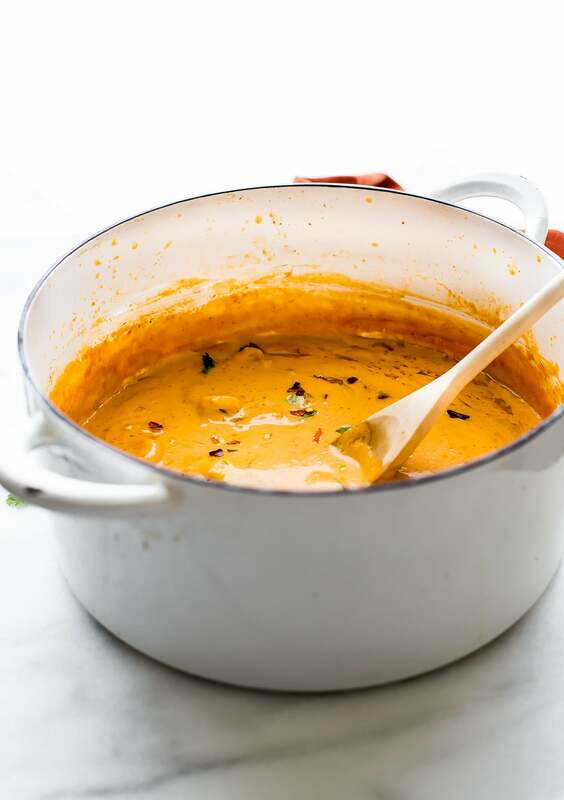 Creamy, spicy, savory, and a little sweet. But the power of this dish lies beyond the flavors. Get ready to be NERDIFIED (it’s a word, I swear). 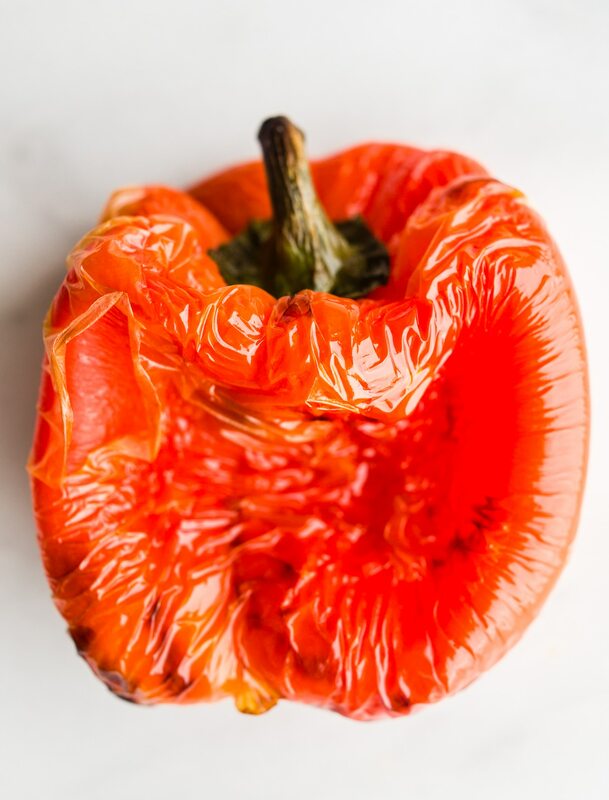 Just one red bell pepper contains 169% of the RDA for vitamin C, making it one of the BEST REAL FOOD sources of this nutrient. HOLLAH! Immunity boosting Vitamin C for the win. Okay here’s where I nerd out a bit. You see, red bell peppers are packed with plant carotenoids (antioxidants). One of them is called luteolin. You knew that though, right? Well you do now. Cause luteolin is pretty badass. Luteolin and quercetin (another antioxidant in red peppers) are mast cell stabilizing compounds for histamine. Meaning, they can help control the release of it. You know, the histamine that causes inflammation in the body and airways. Also, side note: roasted red pepper is also badass. Look at this beauty! Just sayin. Hang with me here. Back to nerd talk and bisque. So this means Luteolin could alleviate bronchial inflammation. As in periodic “attacks” of coughing, wheezing, congestion. NOW YOU SEE IT?!! YES Vitamin C for Immunity! And Luteolin for reducing inflammation, cough, congestion. Ya’ll, the power of food. I get giddy. It’s A-M-A-Z-I-N-G!! 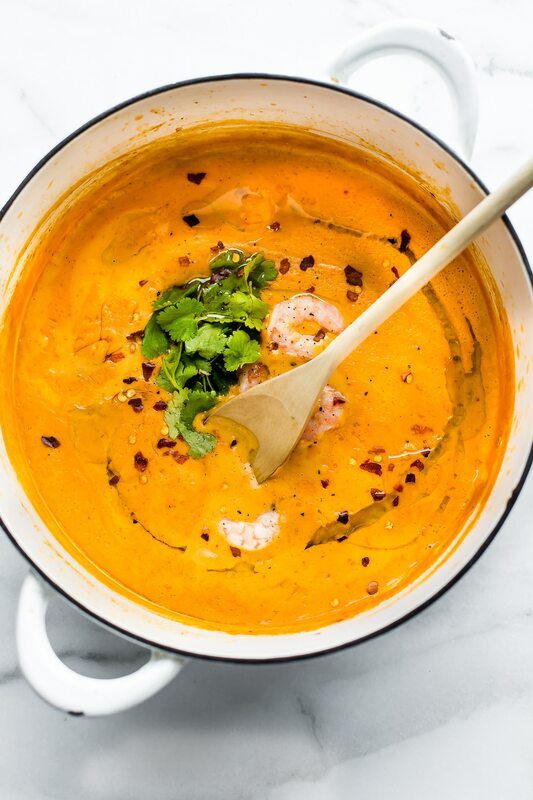 Now, get into the kitchen and make a batch of roasted red pepper bisque with shrimp! 6–8 oz peeled shrimp (without tail). We buy sizzlefish. See notes for link. Place red bell pepper(s) on baking sheet. Broil last 2-3 minutes. Remove from oven. Cool. Remove skin from peppers and slice off the stem. 1 tbsp oil plus your garlic & shallot. Saute on medium until fragrant. Add in the peeled shrimp and water. Cook on medium until shrimp are pink and no longer translucent. Should not take more than 6-8 minutes if shrimp are medium size. (for quick option you can use precooked shrimp & add it thawed at end of cooking bisque). Add in your salt/pepper. Stir all together. Remove shrimp, place in bowl or plate. Add the soup back to stock pot. Bring to light boil. Reduce 10-20 minutes. Add shrimp back in last and keep warm until ready to serve. Serve and garnish with fresh cilantro and extra peppers if desired i.e. jalapenos. Season each bowl with more salt/pepper and red chili flakes to taste. For shrimp we love wild caught Sizzlefish . A hand blender will work well but we LOVE using this new Vitamix blender for extra creamy soups. Vegan option just replace the shrimp with tofu or tempeh, or leave out. I suggest you grab a bowl and filler up! Healing Soup/Bisque to start the week. I think you might need 2 bowls considering it’s post super bowl festivities. OH MY! Did I bore you? 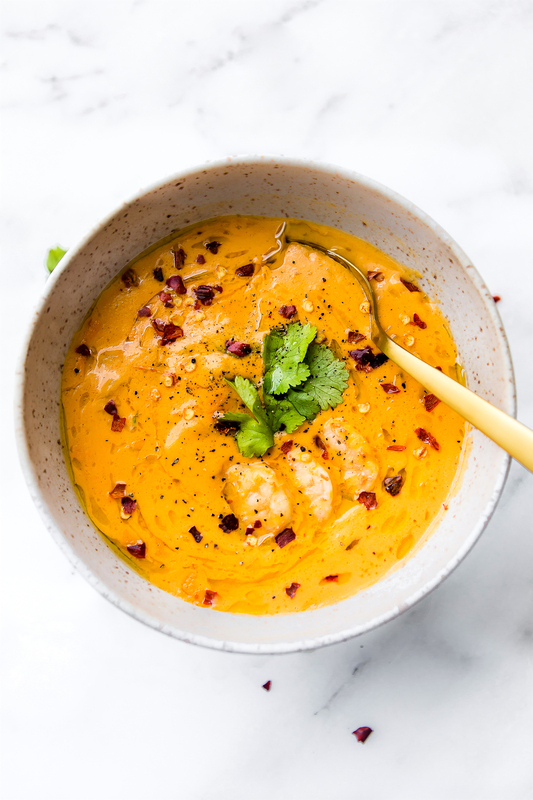 Not to worry, I have this super tasty and easy Roasted Red Pepper Bisque with Shrimp ready for ya! This recipe is gonna rock your world. I mean it’s gonna COMPLETE your life, cure your cold, comfort your soul. Like whoa… Complete with a Capital C! 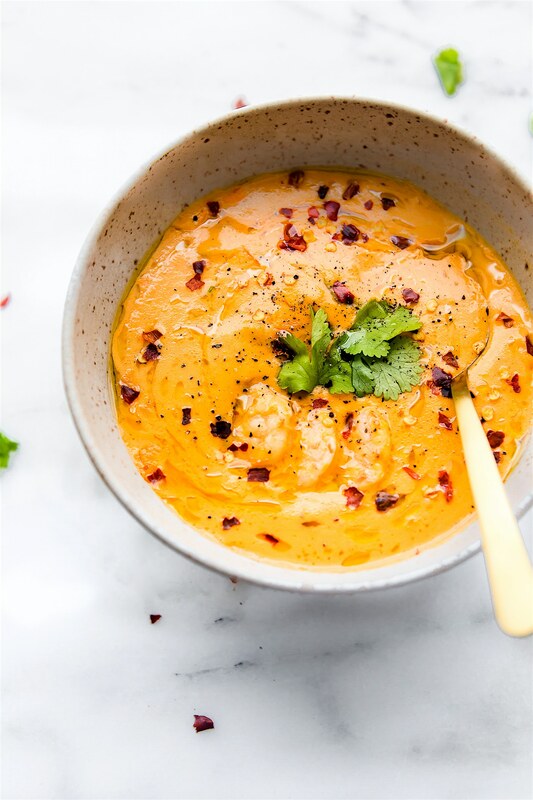 I need this Immunity Boosting creamy roasted red pepper bisque with shrimp! #paleo #dairyfree. 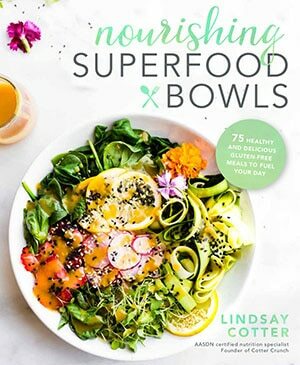 Favorite healing soup? Ever roasted red pepper? Oh wow, this looks creamy and of course I love the nerdy nutrition! Roasted red pepper is the bomb dot com, I love shrimp, and I love spice. Load me up. This soup looks so dreamy! 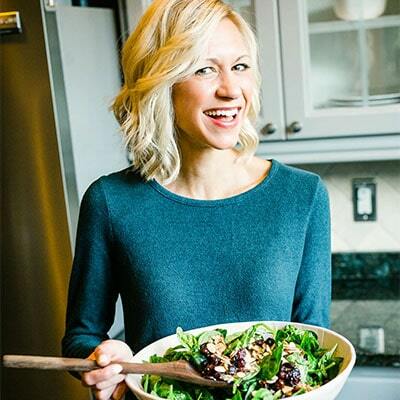 I love that you toss humor and nutrition talk into all your posts. I love to geek out and laugh at your puns :). The Hubs has been sick all week too – I should probably make this soup for him! He loves roasted red pepper! oh good! so glad someone can appreciate the puns. Haha!! Maybe your husband and my husband should hang out and be sick together and we can go do fun things. LOL! Haha – lady, I love ALL your puns! There sure is some nasty bug going around – even here in Atlanta! 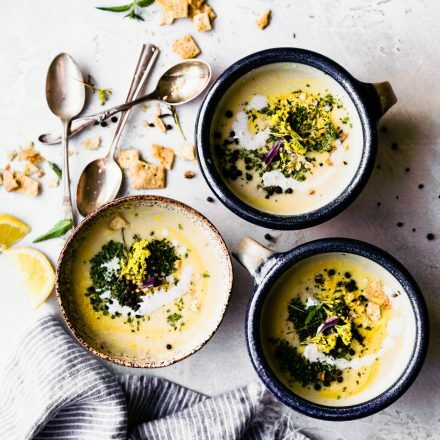 I’m taking some compooter classes and just about everyone has had a case of the 3 C’s – Coughing, Cold, Congestion – so, am needing this mega dose of Vitamin C soup! seriously? did we all get the plague once our new president was elected? Haha, kidding. I know, I am bad. Since I’m currently nursing a bit of a cold, I need this soup and all it’s C driven comfort stat! Also roasted red peppers are glorious. I usually like spicy foods but this soup is too spicy. Followed your exact recipe and was so disappointed it’s so spicy I didn’t get to taste the rest of the flavor of the soup! This may be a silly question, but after removing the shrimp from garlic/shallot water do you dump the water or add the coconut milk, broth, etc to the shrimp water? Hi there! I don’t see where there is water added with the shrimp. All you do is sautee in the pan. Does that make sense? Happy to explain more if needed! No prob! Sautee on medium until fragrant. Add in the peeled shrimp and water. This was written this way. Hi, Sorry, what does the ddd mean in this step? I just made this tonight for my family, this recipe was amazing! Very flavorful, people in my family that aren’t fans of veggies loved it! I snuck in stone rusted sweet potatoes for some added veggies (and also because I didn’t have the starch and tapioca on have) and it still turned out great! Thanks for posting!! Oh wonderful! So glad to hear Ashley! And I love the addition of sweet potatoes to thicken. Wonderful! I will make this again and again. Thanks! If you are on an anti-inflamitory diet…then would red peppers not be restrictive as all nightshade foods are not allowed? It depends on the person. Do you have an autoimmune condition? You could aways try roasted parsnip or carrot bisque. I have a recipe for that. This is the best soup I’ve ever eaten. I sort of want to take a bath in it. Oh. My. Heavens. So good. Would it b suitable to sub almond milk for the coconut milk? And when you mean coconut milk do you mean the caned kind that’s usually in the consistency of cranberry sauce for example? You can! I used canned coconut milk light from Thai kitchen, but I think almond milk would work, Just not as creamy, if that makes sense? Just made this and it is delicious!! It was perfect for this dreary weather we are having. I followed the recipe without substitutions and the spice was the perfect level for us. I did not add the bbq sauce though. Will definitely be making again! Wonderful! So glad! It’s even better the next day (with spices), in my opinion. Thanks for the feedback Gina! Wow!!! I made this tonight and my picky 10 yr old finished her bowl. I did make a couple of substitutions for things I had on hand. I used red onion instead of shallots. I didn’t have either of the starches, so I added some roasted sweet potato and cornstarch. I used less of the cayenne and crushed red pepper since my child doesn’t like spicy foods. I added more to my own bowl and it was excellent!! I think I will add more shrimp and use 2 roasted red bell peppers next time. 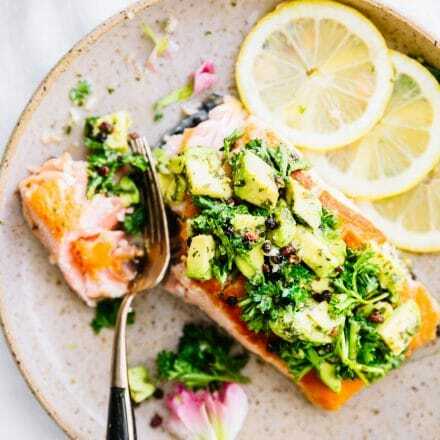 Thanks for the wonderful and healthy recipe. Oh yum!! Love the roasted sweet potato addition! Thanks for feed back stephanie! this is US recipe. But 2 cups is around 475-500ml. Does that help? Looks delicious – can’t wait to make it. 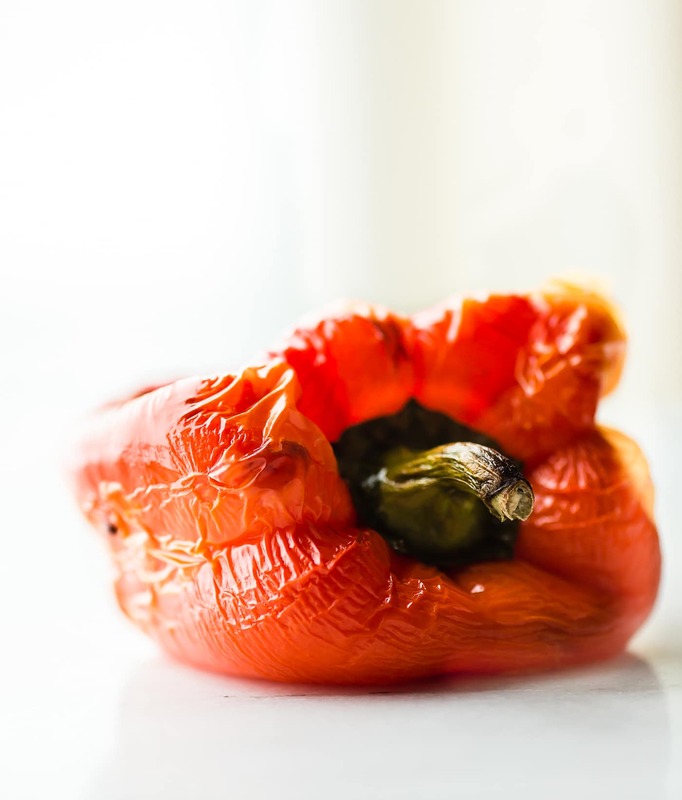 Question – when you roast the red pepper, do you take the seeds out first? Or after? Or do you leave them in and blend the whole thing? Thanks! I roasted the peppers whole, then you peel them after, discard to core, top, and then blend. I kept some seeds in but the ones that were hanging out after I pulled the core out, I just discarded. Does that make sense? Made this as written and it made two dinner size servings. To get 4-5, it will be very small cups. I ate it as a meal. Made this shrimp soup this week (used just over half of the cayenne and hot pepper flakes, no bbq sauce and 2 bell peppers) and my husband and I loved it. Hub said it tasted way better than what is served at specialty soup restaurants in downtown Toronto that he has frequented. Another of yours has made it into our regular rounds 🙂 Thanks for what you do!! Oh this makes me so happy Alicia! Thank you for that wonderful feedback. I appreciate it! I LOVE this recipe. 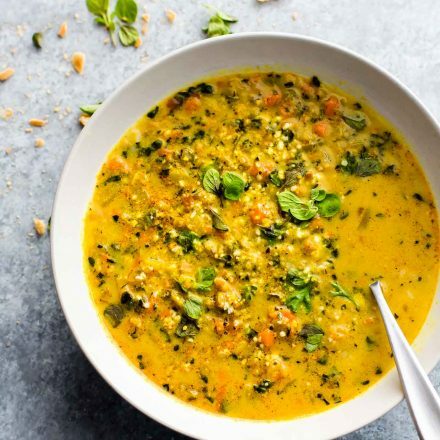 I live in Kenya and this soup is perfect, especially on these cold wintery nights! Thanks for sharing this recipe. Oh yay! So glad. Thanks for sharing that with us Kate! I cut the spices in half and still too spicy for my taste…what can I do to reduce the heat in the rest of it? Oh sorry I misunderstood. I would add more cream or broth and garlic to season. This is basically a sweet and sour soup. Not a fan. Happy I read the comments and dialed (way) down the spices. Really? Sorry to hear that. did you use red pepper flakes? Happy to help fix this for you! Hi Lindsay! It’s just my personal taste. It’s very coconut flavored (duh!) and not for me. I’m guessing that for Thai food lovers it will be a hit! I used just a little bit of red peppers flakes and it was more than enough for me. Still happy I tried it! Got it! Understand and thanks for feedback. I have tried this with rice and almond milk. It’s not as creamy but it has less coconut taste that way. If you can handle real cream, go for it! oops, I meant HOT and sour soup. I’ve made the soup again and it really grew on me! Now I love it, ahah!! I still put less spices. And I had loooots of shrimps. Yum!! That’s so great to hear, Katie! That sounds delicious, love those adjustments! I looked over and back over this recipe, as I made and afterwards, and still can’t find why I did wrong. Not only was the soup not a red/orange color, it was so spicy I couldn’t handle it and it was very watery. The only subs I made were to the level of spicy as well as utilizing tapioca instead of cornstarch. Wow amazing! I’m always looking for new Paleo dishes. I have people in my family that don’t like bell pepper or spice but with all these great comments I gave it a try anyways. Everyone loved it! I did about 1/2 the spice level and it was just perfect for my “non spicy lovers” in the family. Thanks so much! This will be a come back meal for me! I’m so glad! Love that the whole family liked it. Thanks for the feedback shannon!